Watch a performance at the former Chisinau Choral Synagogue that today houses the Chekhov Drama Theatre. 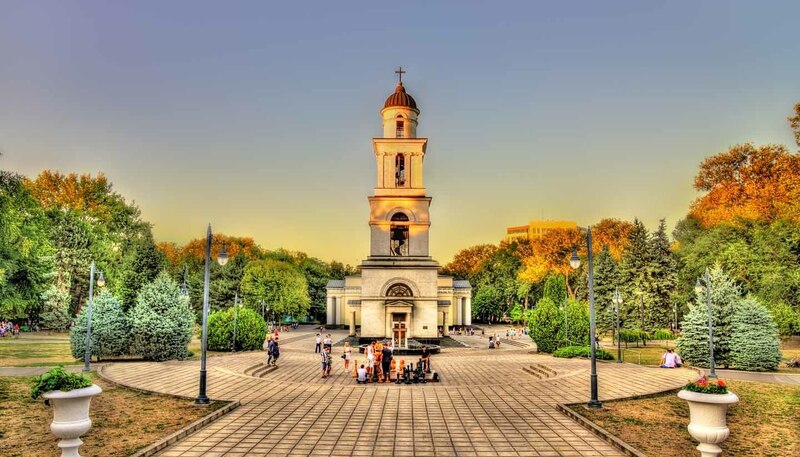 Explore the Moldovan capital of Chisinau (formerly Kishinev), which stands on the banks of the small River Byk. Visit the Pushkin House - the place where the great Russian poet spent his days in exile and where he began working on his epic poem Eugene Onegin. Swim at the man-made Chisinau Lake with picturesque bathing beaches, and boats for hire. Pay respects at the two old cemeteries in Chisinau, the Armenian Cemetery and the Jewish Cemetery. The latter is famous as the burial place for the victims of the Chisinau Pogrom in 1903. Named after the eminent 19th century Romanian biologist Emil Racovita, the cave complex in the village of Criva in Moldova is one of the biggest in the world. A network of underground galleries stretches over 89,000m (291,991 ft) and is split across several levels. Discovered in 1959, the cave is the third largest gypsum cave in the world and parts of the complex are only accessible via large wells. The huge caves have been given names such as Cinderella's Hall and Dacia's Hall reflecting their size and grandeur and there are also several underground lakes including the Blue Lake and the Dinosaur Lake. There are no trail markers but visitors are able to explore the caves in small groups with an experienced guide. Spot indigenous flora and fauna in the country's forests, such as the Stanca-Jeloboc forest. Find out about Moldova's history in the History and Regional Lore Museum, in Chisinau, presented in a beautiful Turkish-style complex, while the Fine Arts Museum houses good examples of Russian, West European and Moldovan paintings, sculpture and applied arts. See the Monument of Stefan cel Mare (Stefan the Great) which was the focal point of meetings and violent clashes between Moldova's Nationalists and pro-Soviet supporters in 1990-91. Relax and unwind in Cahul - a town famous for its thermal spas and mud treatments and also a good local theatre. Hirjauca is a renowned spa in the area. Sup the national wines - the vineyards and wine cellars of Mileshti and Krikova-Veki are renowned throughout the region. Wonder at Benderi (Tighina) - one of the oldest towns in Moldova. Its beautiful 17th-century fortress, as well as the town itself, were seriously damaged during the fighting in 1992.